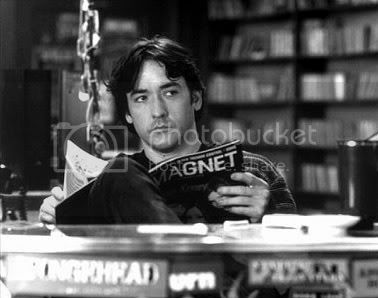 How Much Do I Wish I Was John Cusack? John Cusack you say? What’s he got coming out? Why is this in the slightest bit relevant to anything at all? Nothing and it’s completely irrelevant, are the answers to those fascinating questions, other than I watched ‘Serendipity’ last night and thought how much I want to be him in almost everything he’s ever done. Ever. (Okay its a slow film month, no awards ceremonies, no festivals and no big movies, but we can still have fun yeah? Yeah?!). Never did I think I’d rate a cheesy 80’s romcom as one of my favourite films of all time but with a central performance full of wonderfully naive charm and guts John Cusack brings to life the perfect boyfriend ever. As the tagline says “To know Lloyd Dobler is to love him. Diane Court is about to know Lloyd Dobler.” A guy so unashamedly romantic he’d stand on top of a car with a boombox blasting out Peter Gabriel to his lost love. This is not nearly as lame as it sounds. Honestly. Skip forward 10 years and its as if Lloyd Dobler had homicidal tendencies. Martin Q. Blank is a guy who loves his cat, is loyal to his friends and wants nothing more than his high school sweetheart back. That he kills people for money is neither here nor there because whether its protecting the father of the woman he loves from a gun-toting Ghostbuster or giving her aeroplanes on her bed, Marty is the perfect man. Loving and lethal. When you are a single man who has a pathological need to be in love there are very few things that stop you making toast in a full bath. One of the things that keeps me going is the ridiculously OTT and stupidly naive thought that out there is the right person for me. Its just an excuse really. A way of not getting into any relationship that might fail. But I get to back it up with films like ‘Serendipity’ that don’t help the stupid notion. And of course with John’s Jonathan we have another man who can pull out a one-liner or an emotional sucker punch as easy as you can say “Really Owen, Fictional characters. Fik-shun-al Char-ak-ters!”. Most Quotable Cusack Line: (On being asked his favourite New York moment by a girl he’s just met) “This one’s climbing the charts”.